Non-Millionaires are generally optimistic about their financial futures, according to a new wealthy level study conducted by Spectrem Group of households with a net worth of at least $100,000. 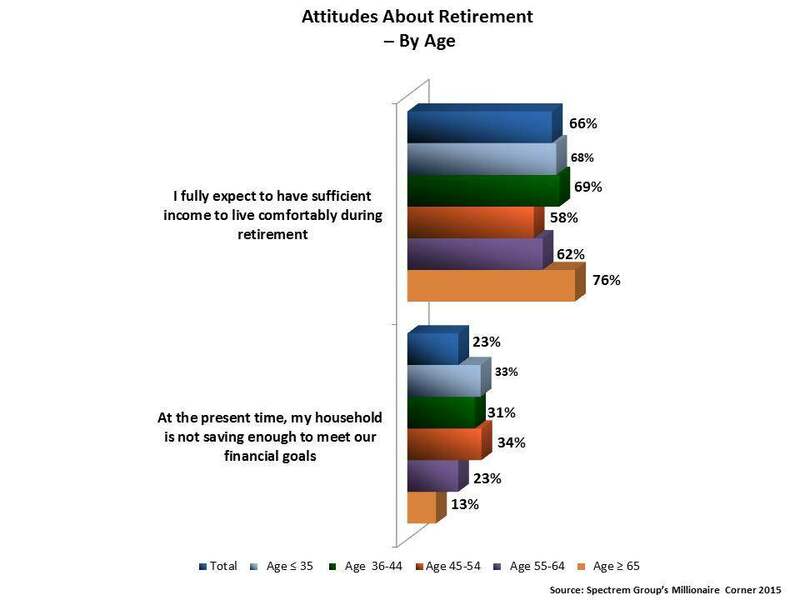 Two-thirds of surveyed non-Millionaires expect to have sufficient income to live comfortably during retirement. Non-Millionaires tend to be less optimistic than the wealthier counterparts, While 66 percent is a substantial majority who feel confident about their retirement savings, it is less than Millionaires (84 percent) and Ultra High Net Worth households with a net worth of at least $5 million (92 percent). But still, less than one-fourth (23 percent) report that at the present time, their household is not saving enough to meet their financial goals. Confidence in their retirement savings is elevated among younger and the oldest non-Millionaire respondents, the Spectrem Group study finds. Nearly 70 percent of respondents under 40 and Gen Xers ages 36-44 expect to be able to live comfortably in retirement.This optimistic attitude is shared by three-fourths (76 percent) of seniors 65 and over. While a majority of Baby Boomers share this confidence, the percentages are lower among those ages 45-54 (58 percent) and 55-64 (62 percent). The highest percentage of non-Millionaires concerned about not saving enough to meet their financial goals are Millennials ages 35 and under (33 percent) and Baby Boomers ages 45-54 (34 percent).